In May 2015, the Constitutional Court of Burundi approved President Pierre Nkurunziza’s bid for a third term, triggering weeks of protests mainly in the capital, Bujumbura. Ahead of the elections, a spiral of violence forced thousands of fearful Burundians to flee their homes. Following President Nkurunziza’s electoral victory in July 2015, the situation further deteriorated with the escalation of clashes between protestors and supporters of the ruling party, as well as with police forces. Efforts to broker dialogue between the various parties have been ineffectual and reports of human rights violations have increased; humanitarian actors have reported the deaths of more than 400 people, including aid workers, since April 2015. 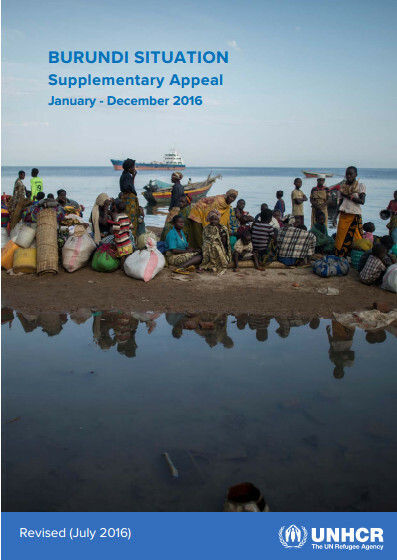 An interagency regional Refugee Response Plan (RRP) and a UNHCR supplementary appeal were launched in 2015 as planning, coordination and fundraising platforms for the emergency response to the massive influx of new Burundian asylum-seekers. Tensions remain high in the capital, Bujumbura, as well as in the provinces of Bururi, Makamba and Rumonge. Consequently, Burundians continue to seek asylum in neighbouring countries. By 1 June 5 2016, the crisis in Burundi had forced over 267,000 people to flee to the Democratic Republic of the Congo (DRC), Rwanda, Uganda, the United Republic of Tanzania, and Zambia. In light of the prevailing situation inside Burundi, it is projected that another 76,000 people will likely seek asylum by the end of 2016, bringing the total to 343,000 refugees since April 2015. In parallel, the Government of Burundi reported that 36,000 Burundians returned from Tanzania last May, of whom 2,500 have been verified as refugees registered by UNHCR in Tanzania. It is expected that 50,000 will return spontaneously by the end of 2016, although conditions are not conducive to their return, and will also require assistance to reintegrate. Finally, some 41,000 internally displaced persons (IDPs) have so far been identified in IOM’s Displacement Tracking Matrix (DTM), covering five provinces of the country. This revised supplementary appeal for the Burundi situation (January-December 2016) presents UNHCR’s additional requirements to respond to the needs of Burundian refugees, returnees and IDPs in 2016, and amount to a total of USD 180 million as detailed in the financial summary table below.